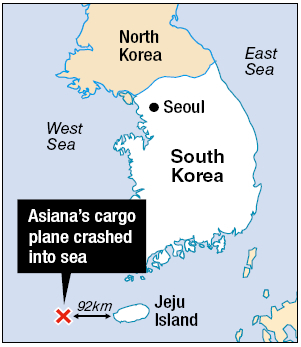 An Asiana Airlines cargo flight bound for Shanghai Pudong International Airport crashed off the coast of Jeju early Thursday while diverting to the island due to a fire in the cargo hold. “The cargo plane said in its last communication with the control center in Shanghai that there was a fire in the cargo hold,” Kim Han-young, Director General of Ministry of Land, Transport and Maritime Affairs’ Office of Civil Aviation, said. According to Kim, the flight’s cargo included 400 kilograms of lithium batteries, paint and other potentially dangerous materials. The pilot, Choi Sang-ki, and the co-pilot Lee Jung-woong, remain missing. Both Choi and Lee are Korea Air Force Academy graduates, who have respectively clocked more than 14,000 and 5,200 hours of flight time, Asiana Airlines said. 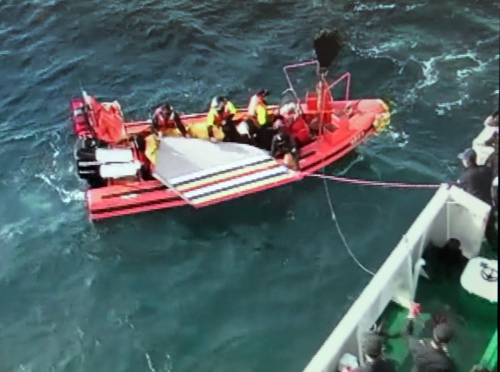 Kim said that search is underway for the pilots and the downed aircraft’s flight recorder, but recovering the device could be difficult if it sank in deep waters. The company, which declared an emergency at 5:30 a.m., said that the accident is thought to have been caused by mechanical problems, but the specific cause is not yet known. Asiana Airlines CEO Yoon Young-doo, who is heading the emergency response team, said the alarm was raised at 3:53 a.m. when an error was detected in the plane’s control systems. This is the first accident involving an Asiana Airlines flight since July 28, 1993 when a passenger flight bound for Mokpo, South Jeolla Province, crashed resulting in the death of more than 60 of the passengers and crew. The flight that went down on Thursday was scheduled to arrive in Shanghai at 4:33 a.m. However, after an error was detected the flight changed course for Jeju. While flying at 7,600 feet 122 km southeast of Jeju coast, the Boeing 747-400F cargo plane lost contact after its crew reported that it would redirect to Jeju at 4:11 a.m. The company was then informed of the developments by the Air Route Traffic Control Center and the coast guard at 4:15 a.m., and a coast guard rescue team was dispatched at 4:45 a.m., the company said. The rescue team found debris from the plane at 6:50 a.m.